JIM FUGLIE: View From The Prairie — The Newest Bridge Across The Little Missouri State Scenic River. What The …? 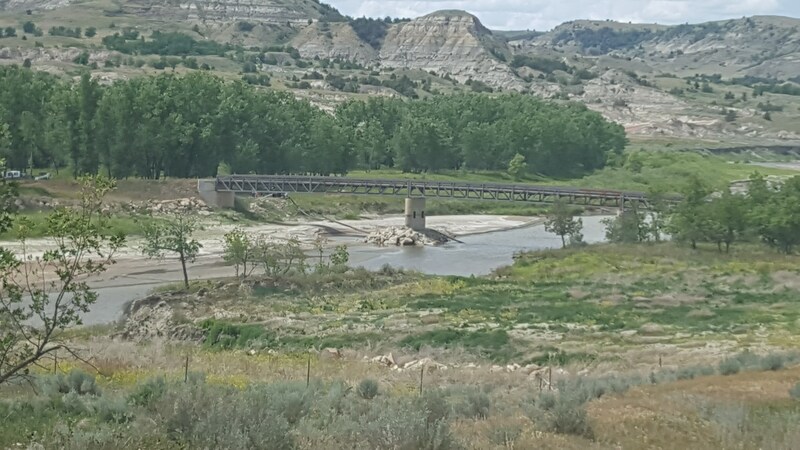 For the past 50 years or so, there have been just five places where you can drive your car across a bridge over the Little Missouri State Scenic River: in Marmarth on U.S. Highway 12, on Pacific Avenue in the city of Medora, on Interstate 94 just north of Medora (two bridges, one going each way), on U.S. Highway 85 south of Watford City (the Long-X Bridge) and on state Highway 22 north of Killdeer (the Lost Bridge). The Billings County Commissioners have made news for the past 10 years trying to build a new bridge over the Little Missouri north of Medora. Their initial idea to put it beside the Elkhorn Ranch Unit of Theodore Roosevelt National Park got shot down, and they’ve been involved in a long and costly EIS process, which has settled on a spot about 12 miles north of Medora, on the Short Ranch. The draft EIS should be released shortly, and a public comment process will follow the release. The county has spent millions of dollars, probably enough to actually build the bridge, on the EIS process. Its still going to have to get permission from the Short family to put the bridge on their ranch. That’s unlikely to happen, so more time and money will have to be spent in a condemnation proceeding. When — or even if — the new bridge will be built remains to be determined by a court, and by the Commission. They should have talked to Wylie Bice. A couple of years ago, Bad Lands rancher Wylie Bice needed a way to get across the Little Missouri on his ranch northwest of Killdeer, so he just went ahead and built a bridge. It’s 9½ miles straight east of the Long-X Bridge, which crosses the river right on the eastern edge of the North Unit of the national park. Bice ran a small trucking company from his ranch in northwest Dunn County before the oil boom. When the boom came, Wylie took advantage of it, buying some trucks, hiring some drivers, contracting with a lot of truck owner-operators and making a lot of money hauling water to and from oil wells. In 2012, he sold the company to a Florida trucking company named Quality Distribution for — you ready? — somewhere between $80 million and $100 million. By the time the dust settles, the final deal will likely be closer to the second number than the first. Well, there’s a North Dakota success story. Kind of like that guy from Fargo who sold his software company to Microsoft. Bice had maintained his ranching operation on the east side of the Little Missouri State Scenic River and flush with cash after selling the trucking company, he bought the adjoining Hellickson ranch on the west side of the river. Both pretty good-sized spreads. And now he had a problem. With ranches on both sides of the river, he needed a way to get back and forth, to move cows, cut and haul hay and operate his irrigation systems. So without really telling anyone, except the Corps of Engineers, from whom he needed a permit, he just went ahead and built himself a bridge over the Little Missouri State Scenic River. It’s a pretty nice bridge! The Corps made him jump through some hoops, but he hired an engineer familiar with the process, and by the spring of 2013 he received permission from the Corps to build the bridge and was able to start construction. He’s been driving on it for about three years now. I drove across the bridge last month. It’s a pretty substantial bridge, 240 feet long, with two large stone/concrete abutments holding it up, much like those under the railroad bridge across the Missouri River in Bismarck-Mandan, although much smaller. It’s well-engineered, though, and when I first came over the hill on the east side of the river, my reaction was “Holy S**t, look at that.” Since then, everyone I’ve shown the photo to has said pretty much the same thing. Not only does he have a bridge, but he has a water depot there for storing water he’s taken from the Little Missouri State Scenic River, ostensibly for irrigation. The depot consists of four large plastic-lined pits, two on each side of the river. Setting up an irrigation operation on BLM land. The day I was there in June, it appeared there were two hired men pumping water from the river to supply the irrigation system. At least that’s what they said they were doing when I stopped to visit with them. He does have a couple of water permits, and I looked at them on the North Dakota Water Commission website. It shows that he hasn’t taken any water out of there in the past 20 years. The Water Commission’s website can be a little cumbersome, so maybe I’m not reading it right, or maybe the info is buried somewhere else on the website, or maybe someone hasn’t been reporting the water they have taken from the river. Someone named Wylie Bice. I think there are some guys over at the Water Commission who read my blog, so maybe they’ll do a little checking for me. But what Bice doesn’t appear to have is permission from the Bureau of Land Management to put a bridge on their land, and a road to it, and two water storage pits. See, Bice owns the land on the east side of the river, but the BLM owns the land on the west side of the river. Likely the grazing rights went along with the purchase of the Hellickson ranch, but the federal government — you and I — own the chunk of land there — about 100 acres — and likely Bice has been paying rent to run cows on it. There’s quite a bit of BLM land nearby, probably also part of Bice’s grazing permit. The folks at the BLM office don’t seem to know anything about the bridge or the road or the water pits, but they should, since things like that would certainly need “permission slips,” and I’m guessing they’re checking on that right now as well. An aerial view of the new bridge over the Little Missouri and the Wylie Bice water depot, courtesy of Google Earth. Private land on the right, public land on the left. The folks at the North Dakota Department of Transportation, which is responsible for inspecting bridges to make sure they are safe, doesn’t know anything about the bridge, and maybe they don’t have to, since it is a private bridge. Still, it’s on public land, and you’d like to think the DOT knows about all the bridges in the state, especially one of this size, crossing our state’s only designated State Scenic River. The folks in the Dunn County Courthouse do know about the bridge, but weren’t involved in permitting it, since they don’t maintain the roads to it. None of them have been out to see the bridge, from what I can tell. In fact, I may be the only person other than Bice, his hired men, the engineers and the guys who built it who have actually seen the bridge. Too bad. It’s an engineering marvel out there, deep in the heart of the North Dakota Bad Lands. The Little Missouri Scenic River Commission, had it been active when this was built, would surely have been involved in passing judgment on it, but the commission has been inactive for about 15 years under the Hoeven and Dalrymple administrations. Our new governor, Doug Burgum, has ordered it reactivated, though, and it might hold its first meeting as soon as this August. I’d hope there would be some discussion of this bridge at that meeting. My friends and I, and my wife and I, canoe the Little Missouri State Scenic River pretty often, but since the boom we’ve avoided that stretch of the river. Too much noise, too much dust, too many flaring oil well pads. On our last trip, maybe10 years ago now, we stopped short of the bridge— which wasn’t there yet — at the ranch of my friend, Curly Haugland, which is about three miles west. Well, that’s what I know for now. I can’t give you directions to the bridge, but I can tell you the legal address is the west half of Section 33, Township 148 North, Range 97 West. That’s it on the left, on the Forest Service map. White is private land, yellow is public land — owned by the BLM. You’ll have to get a Forest Service map and follow the winding gravel, and sometimes two-track, roads. The road from the east is a private road through private land, so you probably should go there from the west, across public land. And you probably shouldn’t cross the bridge, like I did, because you’ll be trespassing. I’ll be checking back with state and local permitting agencies, and I’ll report back here if I learn anything new. Y’know, with all the things I’ve learned, and all the stories I’ve heard, about the Bakken Oil Boom, this takes the cake.